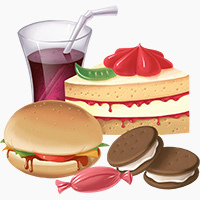 Food cravings make it into the top few reasons why people eat junk food, overeat, and quit diets. They’re not fun! But a lot of people are way more concerned than they really need to be – looking at the research on food cravings is actually pretty comforting because it shows a common pattern of cravings reduction after a few weeks of following a diet. In an interesting twist, the research doesn’t indicate that the macronutrient (protein, fat, and carbs) distribution of your diet matters a lot for cravings. Everyone is unique, but statistically speaking, changing the macronutrient ratio of your food probably won’t change your cravings either for specific foods or for general categories of foods (candy, starches, greasy food). High-protein diets don’t perform much better than any other type of diet for preventing food cravings, and contrary to popular belief, restricting carbs doesn’t cause carb cravings either. In fact, restricting carbs might help reduce carb cravings, although this study was in women with cancer, which is a very specific group with special health needs and results might not apply to the general population. If it isn’t the macros, what is it? Studies show that the real key isn’t which diet you’re on but how consistently you follow it and how long you’ve been doing it. Contrary to the popular belief that restriction causes cravings and we always crave what we can’t have, we actually learn to stop craving what we don’t get – if only we can avoid it for a few weeks. It doesn’t actually take that long, either! In this study, researchers gave subjects a low-calorie and low-carb (about 14% energy from carbs, so pretty low but not keto-level low) diet for just 4 weeks. By the end of the 4 weeks, cravings for sugar and starch were both down by 12%, while cravings for fatty junk food (ice cream, etc.) were down by 11%. Of note: this study was funded by Atkins Nutritionals, which provided some food for the participants, but in the slightly longer term, this review of multiple studies found strong evidence that any kind of calorie restriction reduces cravings by at most 12-16 weeks on the diet. For the keto folks, this study tested keto specifically – although be aware that they used a commercial keto diet product and that the authors of the study are involved with the company that sells the product. The researchers found that over 4 months, cravings declined rapidly and significantly, with the big downturn in cravings kicking off just as subjects got into ketosis (aka right away). So, food cravings decrease after some time on a diet, and the macronutrient (protein, carbs, and fat) composition of that diet doesn’t affect this to a huge degree. But one more thing that might actually affect food cravings is how (if at all) you work craved foods into your diet. Go cold turkey and stop eating junk food completely. The paper suggested that changing the frequency of eating craved foods is more effective than changing the amount. In other words, if you want to reduce cravings, it’s better to just save your junk food allowance for a real candy bar once a week, instead of teasing yourself with a mini candy bar every day. Or just go full commitment mode and completely eliminate junk food, if that works for you. 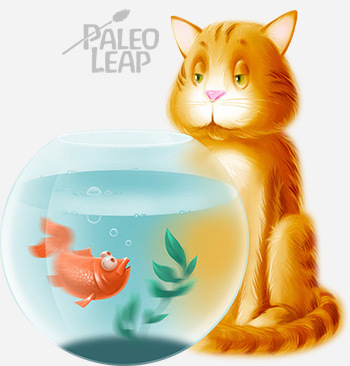 Do you feel like this cat staring down the fishbowl every time you pass a vending machine? If so, you might have a cravings problem! This was an average result – there will probably be some outliers who do a lot better with higher frequency and smaller servings. If that’s you, it always makes more sense to do what works for your own body than to do what works for average people in a study. But this study bears emphasizing if only because general diet advice is so heavily skewed towards eating miniature servings of junk food “because otherwise you’ll feel restricted and binge.” That’s not necessarily the case just because everyone repeats it. So the real million-dollar question is: how can real people in the real world actually get through the first few weeks of cravings before the benefits of following their diet kick in and they start seeing the pressure ease up. Luckily, there are tons of strategies for managing cravings in the moment – here are eight of them, including – and this is really, honestly, scientifically supported – Tetris. Read the article: there’s a whole study on it! Another technique not listed there is decentering – that’s when you get some distance from your thoughts and just observe your thoughts as thoughts. For example, “wow, I’m craving chocolate right now; that’s a desire I’m having but I don’t really have to immediately go out act on it, any more than I’d act on my urges to snap at my annoying coworkers when I’m having a bad day or.” It helps make the craving feel less powerful, which makes it easier to brush off and get back to your day. Cravings: there is good news! We might always hanker after the forbidden fruit for the first month or so on a new diet, but research actually suggests that cravings subside after significant time restricting the food in question. It really does get a lot easier: it’s all about getting yourself over that first bump and into the groove of eating well.